I was recently asked how the installed flow characteristic of an equal percentage valve in a system that includes a significant amount of pipe or other pressure-consuming elements “magically” becomes a linear, or approximately linear, installed flow characteristic. Although it has always seemed reasonable to me, I couldn’t find a simple formula or explanation that verifies this fact. However, a computerized analysis, using a mathematical model of a system, does confirm that it is indeed the case. To demonstrate this, we'll consider the system shown in Figure 1. This is a system with a centrifugal pump and a significant amount of pipe, both upstream and downstream of the control valve. A static analysis shows that as flow changes, the valve inlet and outlet pressures (P1 and P2) change as shown in the Figure 1 table and graph. I also constructed a control valve sizing worksheet that can graph the installed flow characteristic of a given valve in the system where it will be installed. The installed flow graph is based on the valve manufacturer’s tabulated values of Cv vs. relative travel (Table 1), the user’s input of process flow conditions, such as those tabulated in Figure 1, and a process model based on the principle that the pressure losses in a piping system are approximately equal to flow squared. The process model and how it's applied are shown in Table 2. Figure 2 is a screen shot of the user interface of the worksheet showing the process data for the example in Figure 1. It also shows the calculated required valve Cv for both the minimum and maximum specified flow. Figure 3 shows the installed relative flow graph (in blue) produced by the worksheet, along with the valve’s relative inherent flow capacity, Cv (in gray). Figure 3 also shows the pressure drop across the valve (in red), as determined by the process pressure model in Table 2. In Figure 3, the vertical axis on the left is for the valve pressure drop vs. relative valve travel. The vertical axis on the right is for both relative installed flow and for relative valve flow capacity (Cv). It's important to note that that both the installed flow graph and inherent valve capacity (Cv) graphs follow the common convention of showing them as being on a “relative” scale. That is, a relative flow of 1 is 100% the fully open flow, and a relative flow capacity (Cv) of 1 is 100% of the fully open manufacturer’s rated Cv. This is a commonly used convention, as it makes it easy to compare the shape and linearity of the inherent and installed behaviors of different valve types and sizes. In the case of the example, it's clearly seen that based on a computer model of this system and valve, the installed flow characteristic of the equal percentage valve in this system is nearly linear where the pressure drop across the valve decreases with flow. The downside of showing the valve’s inherent flow capacity (Cv) and installed flow as relative graphs is that it masks what's really going on. What actually causes an equal percentage inherent flow capacity to become a nearly linear installed flow when the pressure drop across the valve decreases with increasing valve travel and increasing flow? 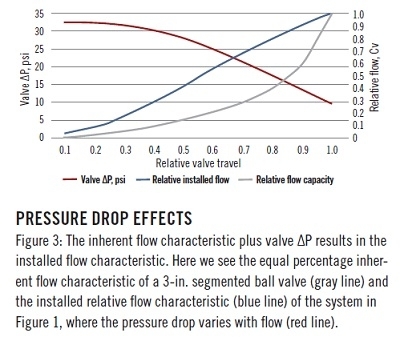 In Figure 4, I've clarified what's really going on when an equal percentage valve is installed in a system where valve pressure drop decreases with valve opening and increasing flow. Here are two screenshots superimposed on each other from the same worksheet. I slightly modified the worksheet to graph actual flow (left axis) not as relative flow, but in actual flow units of gallons per minute. This is so the difference can be observed between what the fully open flows would be if the valve pressure drop remained constant with valve travel and flow (blue lines), and if the valve pressure drop decreased with valve travel and flow due to pressure losses in the system (red lines). 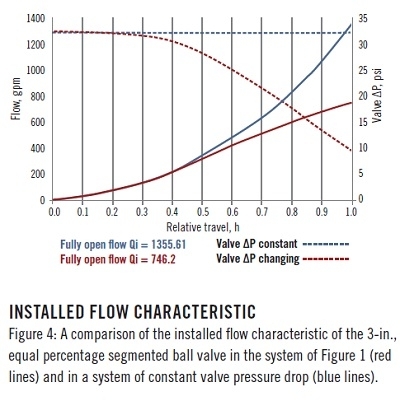 When valve pressure drop remains constant at all valve openings and flows, the installed flow characteristic (blue line) has the same shape as the valve’s inherent flow characteristic—an equal percentage characteristic. When an equal percentage valve is installed in a system where, due to ressure losses, not only is the shape of the relationship between valve travel and flow changed, but the fully open valve flow capacity is significantly reduced. This can occur due to pressure losses in system piping and other pressure consuming components such as elbows, isolations valves, heat exchangers, etc. When observing the red flow curve, one can see that when the valve travel is relatively small, the pressure drop is not changing very much. This means the installed flow graph’s shape is not much different than the inherent flow curve of the valve. But as the relative valve position increases, due to the flow-squared nature of pressure loss in the piping system, the pressure drop available to the valve starts decreasing rapidly. This causes the flow to increase more slowly, ending up much less when the valve is fully open. The end result of this analysis is that a valve with an equal percentage inherent flow characteristic will exhibit a nearly linear installed flow characteristic when installed in a system with a significant amount of pipe and/or other pressure-consuming elements. The calculation of installed flow is based on a simple mathematical process model (Table 2) using the principle that pressure losses in a piping system are approximately equal to flow squared. There are 10 sets of flow calculations, one based on the valve’s Cv in Table 1 for each 10-percentage-point valve travel increment between 10% open (relative travel of 0.1) and 100% open (relative travel of 1.0). Because the goal is to calculate flow, but the pressure drop across the valve is a function of flow (which initially is not known), an iterative calculation is required. The worksheet makes an initial guess at flow for each of the 10 calculations. The guess is always less than what the anticipated actual flow will be for that particular increment of relative travel. For the first travel increment (relative travel of 0.1), the initial guess is arbitrarily set at 0.01 of the minimum specified design flow. It’s reasonable to assume that the flow through any practical control valve at 10% travel will be greater than 1/100th of the minimum design flow. For the subsequent calculations (relative travel increments between 0.2 and 1.0), the initial flow guess is the actual flow calculated from the previous travel increment’s calculation. The calculation of flow at each increment of relative travel starts with its initial guess for flow and the corresponding Cv (calculated using that flow rate guess, the valve P1 and pressure drop calculated by the Table 2 model at that flow rate). The absolute value of the difference between this Cv and the user’s input of the valve’s rated Cv in the table of Figure 1 is recorded for that iteration. is the point where the calculated Cv comes the closest to the valve’s Cv in Table 1 for that increment of relative travel. The flow from that iteration then becomes, within 1%, the flow at this increment of relative travel for this valve in this system. After the above procedure for all 10 increments of valve travel, graphs like the ones in Figure 4 are constructed. 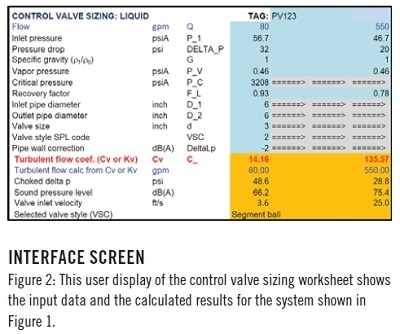 Although not mentioned previously, the reason FL (the Liquid Pressure Recovery Factor of the valve) is tabulated in Table 1 is because the iterative calculation checks and corrects for choked flow. The effect of pipe reducers on both Cv and FL are also included in the calculations.